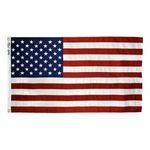 Our Tough-Tex American flags are the strongest, longest-lasting all weather flag on the market today. 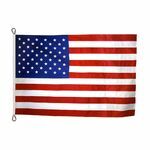 Each American flag is made from an open-weave polyester material that reduces fabric stress and ideal for high wind situations. Great for long-term display, industrial use, and commercial flag displays. Made in the USA!